Bread pudding has to be one of my all-time favorite desserts-- what I love about bread pudding is that it's rather hard to mess up; you can pretty much toss in any of your favorite mix-ins, and you can bake it as little or as long as you wish, depending on your preference. The blend of milk, sugar, and eggs really turns out delicious whatever way you make it. You can also use any combination of bread that you want (I've used croissants, multi-grain, white, italian, french, cinnamon raisin, wheat, challah, brioche-- you name it! You can even use doughnuts! ), stale or fresh! You can also make a huge batch all at once, and this is definitely an easy but delicious and impressive crowd pleaser. It may take a few tries to try to reach the perfect consistency that you're looking for, but I've included the general guidelines for making the texture that I prefer. Instead of using stale bread, I actually always prefer to use fresh bread and oven-dry it, so that the bread is crunchy on the outside but soft on the inside--using oven-dried bread helps to achieve a texturally pleasant bread pudding that is crispy on the top and soft and custard-like on the inside. When I serve bread pudding, I like to serve it straight from the oven, topped with chilled crème anglaise or vanilla ice cream. Crème anglaise is a custard sauce that is poured over or served alongside many desserts. It can also serve as the base for ice cream or crème brûlée. You may add any liquor or flavoring to it that you like (vanilla, rum, orange zest, etc)-- you start by tempering the eggs and then slowly heating the sauce until it thickens-- this may take some practice! You want to slowly heat the sauce on low heat and whisk constantly, since excessive heat may cook the eggs and you may end up with scrambled eggs!! 2. Cube or tear your bread into desired size. You want the pieces to be approximately equal so that they will layer nicely in the pan. Line 2 baking sheets with the bread and place them in the oven for 15-20 minutes. You want the outer edges to be crisp while the insides to still be soft. 3. Meanwhile, butter a 9x13 baking dish and sprinkle the dish with 2 teaspoons of white sugar. This will allow the bread pudding to develop a caramelized crust. 4. Whisk the eggs together in a small bowl. In a mixing bowl, combine the eggs, sugars, milk, butter, salt, vanilla extract, cinnamon, and rum. 5. Transfer the oven-dried bread pieces to a mixing bowl. Reserve about 1/4 of the bread (this will serve as the top crust) and set aside. Turn the oven up to 350F. 6. 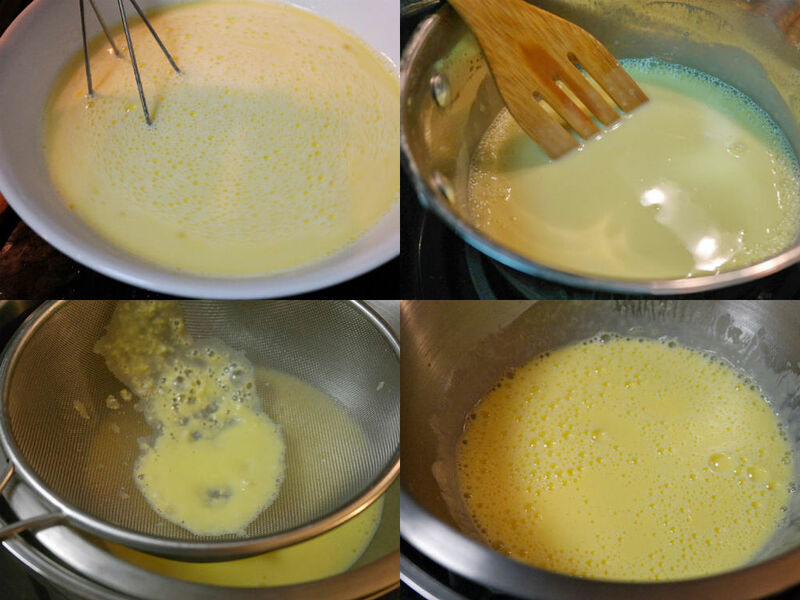 Pour the egg/milk mixture over the bread pieces in the mixing bowl, and gently toss with your hands, making sure that all of the bread is covered in the custard mix. You don't want to over-mix, as this will cause the bread to become soggy and break apart. Let the mixture sit for 20-30 minutes. 7. Add your mix-ins: I like to use dark chocolate chunks and toasted chopped hazelnuts, or rum-soaked raisins. Feel free to get creative here! The bread pudding mixture is a great vessel for many combinations of flavors, so don't be afraid to experiment! Again, use your hands to gently mix. 8. Transfer the bread pudding mixture into the baking pan, making sure that it is spread out evenly. Scatter the oven-dried bread that you set aside before on top, and press down firmly on each of the bread pieces (You want these new pieces of bread to also have some of the custard mix on them). If you have any of the liquid left over from the mixing bowl, pour it over the baking dish. 9. Bake for 30-45 minutes. When you pick at the surface with two forks, no liquid should ooze out. You want the bread pudding to be crunchy on top but still soft and pudding-like on the inside. Check at 20 minutes, and if the top begins to brown too quickly, cover the baking dish with aluminum foil. While the bread pudding is baking, you can make the crème anglaise! ...continue for the crème anglaise recipe! 1. Pour the milk into a medium saucepan, along with the sugar and milk. Gently heat on low-medium heat, until the milk is hot to the touch but not scalding. 2. Meanwhile, separate the eggs and whisk the yolk together in a small bowl. 3. 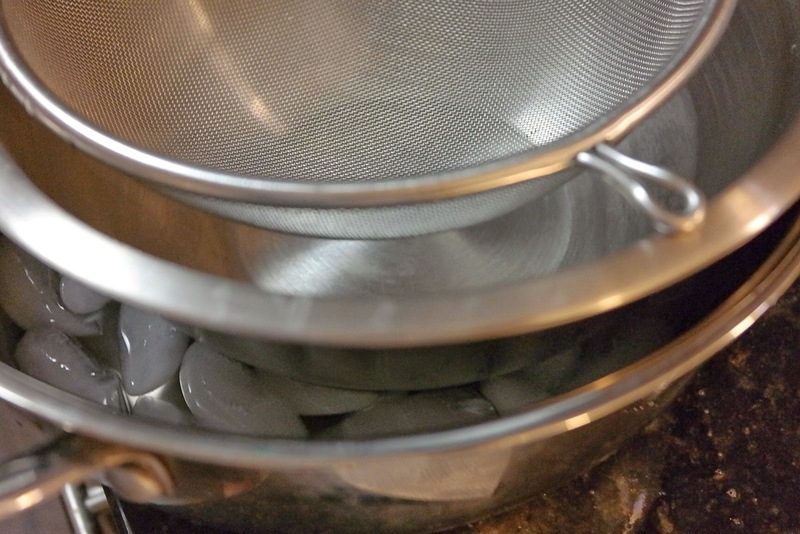 Place a separate mixing bowl on top of a bed of ice water, and place a strainer over the mixing bowl. 5. Immediately pour the custard through the strainer. Stir frequently until it cools down. Transfer the custard to the refrigerator and let it chill before serving (you may also serve it hot if you wish).